Most Canadians my age, even if they're not a hockey fan, know that the question, "Where were you in '72?" refers to when Paul Henderson scored the winning goal against the Soviet Union. I don't know exactly where I was when the goal was scored, but I definitely remember when it happened. Going back a little further to 1963, "Where were you when JFK was shot?" I was only five years old, so I was at home with my mom. I do actually remember watching the funeral on tv....while eating a mustard and onion sandwich....don't ask; I have no idea! There are just some things that stick in your mind. So, that brings me to, "Where were you when you heard that Elvis had died?" I was 19 years old, and wasn't a huge Elvis fan, but I know exactly where I was when I heard the news. I was with my brother and sister, and we had taken Dad's car down the road to pick chokecherries. We had the radio on while we picked, and that's when it was announced that Elvis had died. In that moment, and it seems forevermore, a connection was made in my brain. For the past 39 years, I have depended on the radio, or in more recent years, Face Book, to remind me of the day that Elvis died...so this year, when Brian came home from work on the 17th of August, I said, "Do you know what today's date is?" He answered, "The 17th?" Me; "Yes, the 17th! Do you know what that makes yesterday?" Brian: "Oh, the 16th." Me: Yes!! And not one person on Face Book mentioned Elvis yesterday!" Brian: "Well, the nerve of them; how dare they not?" Me: "I know!! 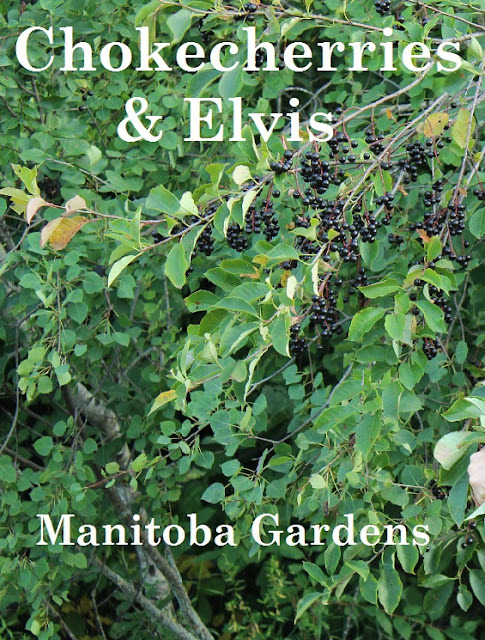 How am I supposed to remember chokecherry picking time, if people forget Elvis?!" Yes, this was a real conversation. (tongue in cheek, but real!) My family knows I take my chokecherries very seriously, and if you asked them the significance of August 16th, they would tell you, "That's the day Elvis died; it's chokecherry season!" I guess my addiction stems from my childhood. I grew up on a farm with seven siblings, and we spent a lot of time wandering the countryside. We all knew what was safe to eat, and what wasn't...maybe from someone's previous experience! Saskatoons, pin cherries, ground cherries, cranberries and nanny berries were a few of the other things we snacked on. But chokecherries were one of my favorites....yup, the same kid that ate mustard and onion sandwiches...and several other strange things I won't mention here. In case you're wondering, yes, Mom did feed us good, healthy meals. Chokecherries, all washed and ready to eat.... or turn into jelly. I know most people don't have the strange taste buds I have, so I've included a recipe for Chokecherry Jelly. I haven't made it in years, but Mom and I used to make it together. *Hint: If it turns out a little runny, it makes great syrup for ice cream! Add water to cover the chokecherries. Bring to a boil, then simmer for 15 minutes or until soft. Cool and strain through cheesecloth or a damp jelly bag. Pour juice into heavy saucepan. Add sugar and stir to mix. Place over high heat and bring to a boil, stirring constantly. Stir in pectin. Bring to a full, rolling boil and boil hard for 1 minute, stirring constantly. Remove from heat. Stir and skim off foam for 5 minutes. Pour jelly into hot, sterilized jars to 1/4 inch from the top. Seal with canning lids. Process in a boiling water bath. Have to get out and see if there are still any good ones left. I just picked more last night. Come down Hoops Loop, and you'll find lots. Funny how our minds work. I have all kinds of silly associations like that to keep me on track. Mid-August is my son's birthday, so I know that's about when we start to harvest food from the garden, especially green beans!